Farc rebels in Colombia have handed over all of their personal weapons, completing the transfer of arms a day ahead of a revised schedule, United Nations monitors in Colombia say. 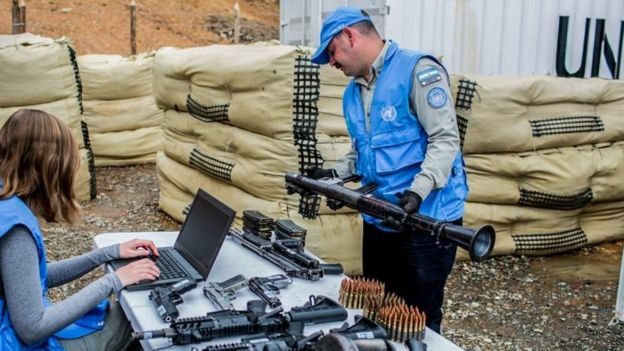 A total of 7,132 weapons have been registered and boxed away, the UN says. The monitors said they had also found and emptied 77 out of the Farc's 900 arms caches hidden around the countryside. The arms handover is a key condition in last year's peace agreement. The deal seeks to end more than five decades of conflict and negotiations between Colombia's largest left-wing rebel group and the government. But US monitors have warned that the task of locating and emptying the Farc's remaining caches could take many months because of the difficulty in reaching them. Some of them are reachable only by river or foot through dense jungle and mountain terrain. Many are booby-trapped and need to be painstakingly dismantled.